When the Spanish workshop Radical Ducati closed in 2014, we feared it would be the last of Pepo Rosell’s incredible work. 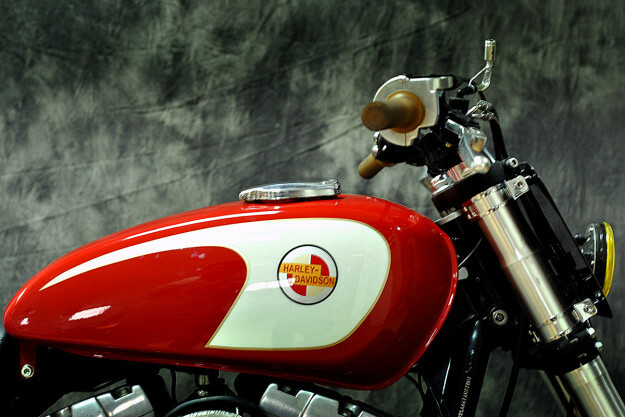 His 13-year partnership with Reyes Ramon produced some of the best ever custom Ducatis. Thankfully, after a 12-month hiatus, the Frenchman has resurfaced to launch a new workshop—Extreme Pepo. He’s still based in Madrid, but has a more relaxed approach to business. In an effort to break away from his past, Pepo has begun working on different platforms. And he’s proved that his ability stretches well beyond the confines of Ducati. His Triumph Speed Triple was the starting point, but if that unexpected maneuver didn’t stir up some old Radical fans, his latest work surely will. 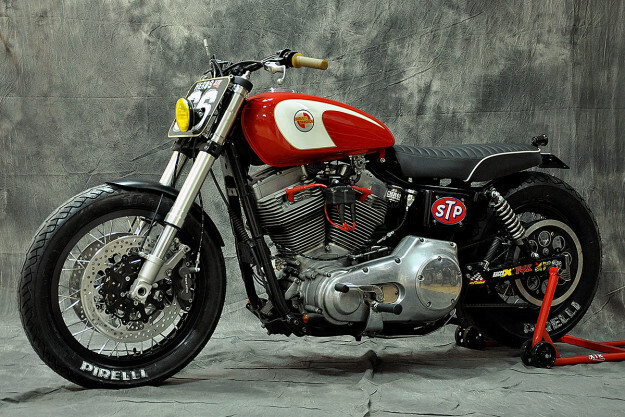 ‘Gabrielle’ is Pepo’s first ever Harley-Davidson build, and it’s a complete departure from his Radical Ducati style. Gabrielle isn’t just a venture into a new platform though. 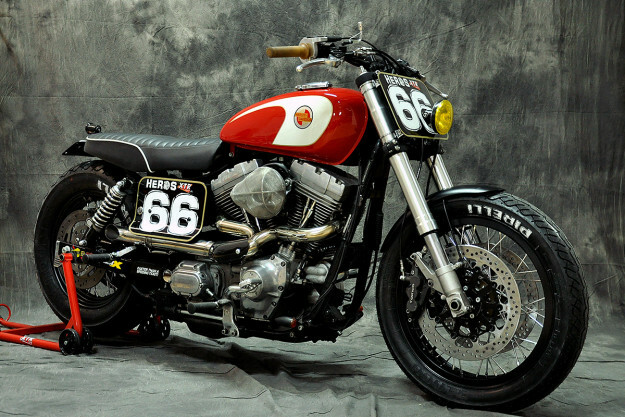 On this 2000-model Dyna Super Glide, Pepo has also added a dash of street tracker style. 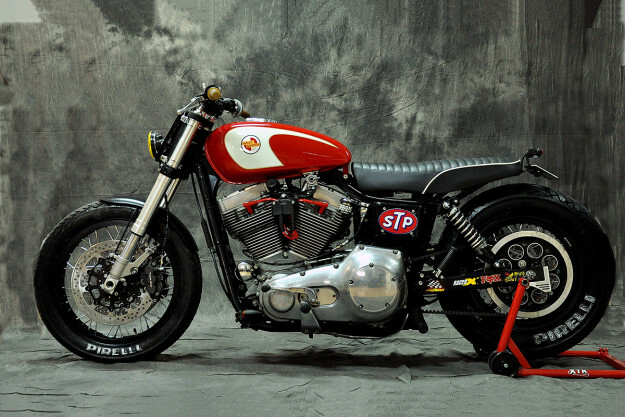 The build began when a customer dropped his Dyna off at the XTR workshop. His only request was that the bike should be able to carry a passenger, and it should have a wide set of handlebars. To upgrade the Dyna’s front end, Pepo has installed a set of Suzuki GSX-R forks and yokes. The front brakes are a heady mix: Hayabusa 6-piston calipers, custom made 320mm rotors, high performance Fren Tubo brake lines, and a GSX-R lever assembly. The retuned carb breathes freely through a custom made mesh filter. 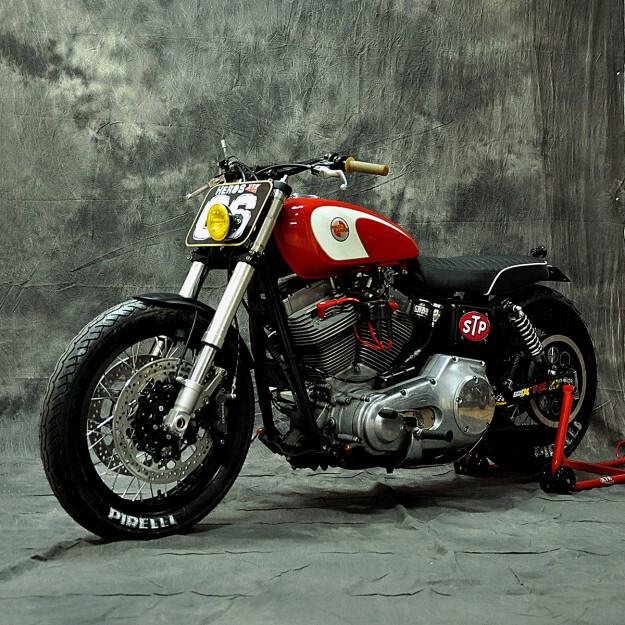 It spits out an unashamed v-twin rumble through custom-made 2-into-1 exhaust headers and a muffler with a removable neighbor-friendly dB killer. And to ensure all that power can be accessed with a flick of the wrist, there’s a Gonelli quick-open throttle. 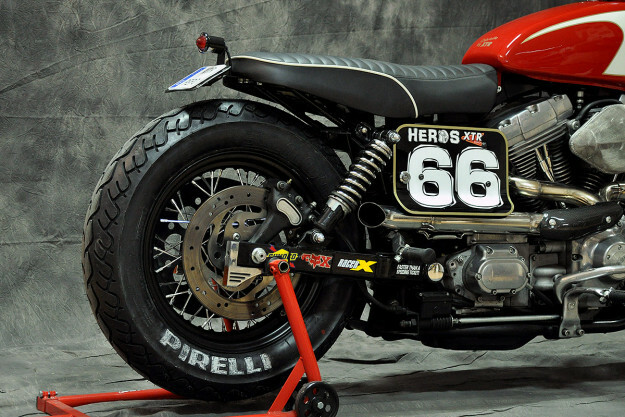 The request for two-up riding meant modifying the rear subframe to support a modified seat lifted from a Mash 500, a small-volume retro-style bike sold in France. With the rear fender gone, Pepo fabricated a custom number plate mount to protect the rider from road grime. To drop some weight, the hefty stock battery has been replaced by a lithium version; it’s mounted in a custom box behind the race-style number plates. 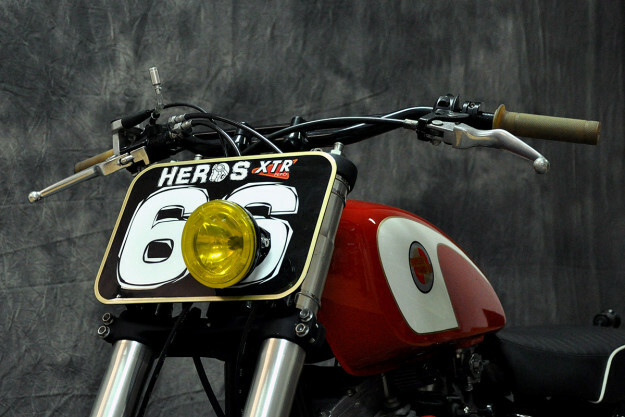 Up front is another flat-track-style racing number, supporting a custom-made headlight with a yellow lens. 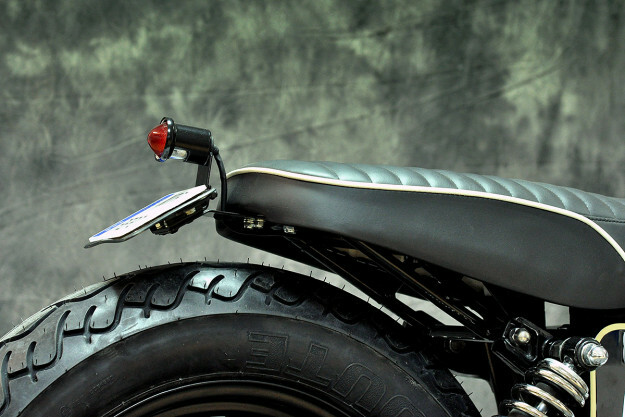 Classic motocross-style bars are paired with Gonelli natural rubber grips. 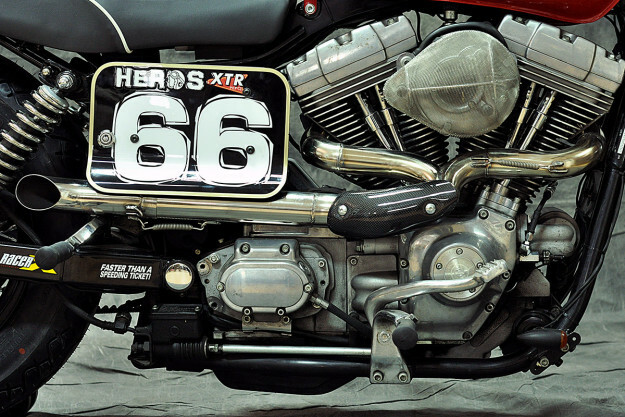 Pepo’s kept them tidy by mounting the speedo and oil pressure gauge to the frame, beside the rider’s left thigh. He’s also replaced the bulky Harley switch blocks with compact Motogadget units. The final tweak (and a useful weight improvement) comes from swapping the Super Glide’s cast wheels for spoked rims. They’re now wearing Pirelli’s MT66 Route 66 rubber. 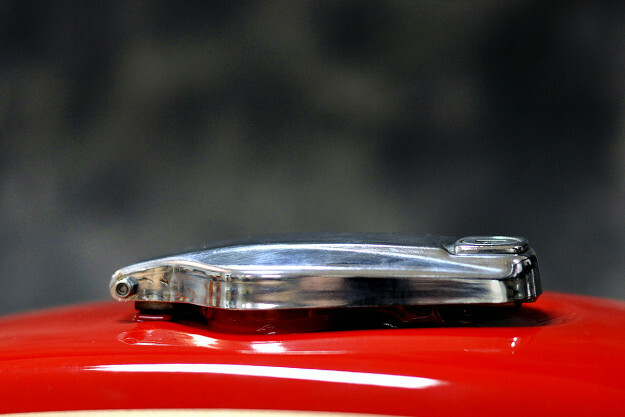 Happy with the result, Pepo is now looking at the Harley platform differently. And we could be be seeing more Harleys from his new venture. 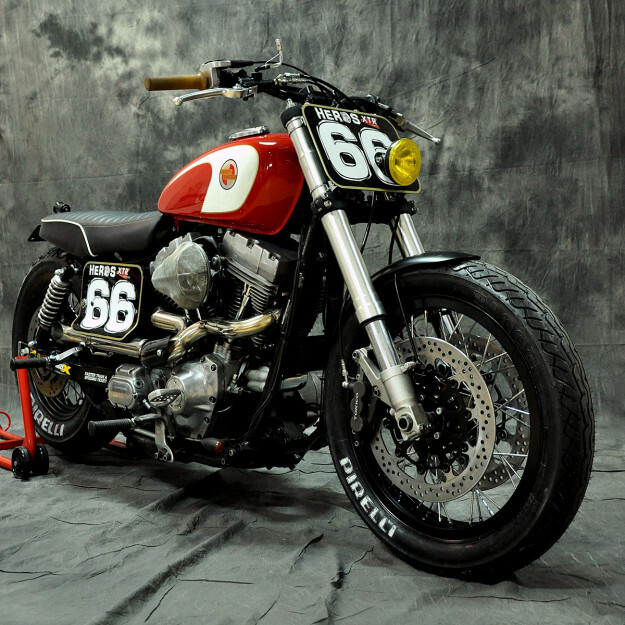 This Dyna custom may not have the same aggressive racetrack appeal of the Radical Ducati bikes, but we think Pepo may be on to something. What brand would you like to see him tackle next?